Syrah/Shiraz is to wine grapes as George Clooney is to Hollywood. Movies. The entire world. Dark and handsome, rich, very popular, and gets better and better with age, syrah/shiraz is a dark-skinned grape used to make full-bodied, powerfully-flavored red wines and blends. In 2004, it was estimated to be the world's seventh most-grown grape. Syrah/Shiraz has a wide range of flavors, depending on the soil and climate in which it's grown. It ranges from violets to berries and features rich flavors such as chocolate, espresso and black pepper. While the practices of winemakers may vary (think, more or less time in barrels, oak barrels vs. steel barrels), this variety influences secondary flavors and can produce really interesting and deep flavors. For instance, a longer time in the bottle will bring out tertiary earthy notes, like leather and truffle. Grape-ograph -- Where’s it from? Syrah has been genetically tested and found to be the offspring of two grapes native to Southeast France – the dark-skinned Dureza, and a white grape called Mondeuse blanche. Both of these are relatively obscure today. In France (and most of Europe, as well as the United States), the grape is widely known as Syrah, while the grapes in Australia, South Africa and Canada are called Shiraz. Each region approaches the wine uniquely. Elsewhere in the world, the name tends to reflect these stylistic differences. 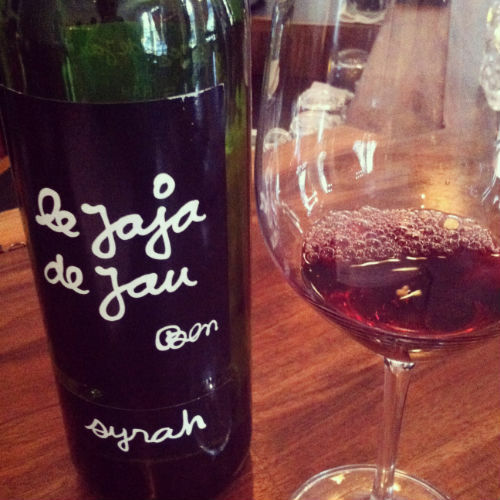 Syrah is sometimes regarded as the more elegant, full of smoke flavors and less fruity than it’s counterpart. Shiraz, on the other hand, tends to be sweeter, featuring riper berries, a fruitier flavor, with more pepper than smoke, and a higher alcohol content. The strong flavors in Syrah/Shiraz need equally strong flavors in the foods with which they’re paired. Most red meat is a given, including rich and hearty stews and spicy, flavorful sausage. Avoid cheese and seafood, as the heavy flavor of the wine tends to overpower the more subtle flavor profiles in these foods. If you're vegetarian, try it with barbecue, grilled mushrooms, or any veggie dish heavy in garlic.